"The lad got over-excited when he saw the whites of the goal-post's eyes." "When you're getting into mid-winter in England, you need a few of the hard white men to carry the artistic black players through." "You can never rule out a lesser club like Palace, from winning the league. So much can happen." Q: What sporting event would you pay most to watch? A: Someone absolutely mashing Prince Nazeem Hamed. "Dave Bassett has said he could not work with me and he is right. He is a dinosaur whose time has gone." "I know a lot of people think an investment of £30m is an over-valuation, but I believe it is a very fair price for where I think I can take Palace over the next five years. I am absolutely convinced it will be a good solid financial investment as well as one that secures my love and passion for Palace." "At the end of the day, it's all about what's on the shelf at the end of the year." "I understand Lombardo getting the coaching job, but what is Brolin's role? Catering manager?" "A lot of people don't expect me to be any use to Palace. Then a lot of people talk sh!t." "We hope that supporters will respond to our efforts to become a force to be reckoned with and also establish a squad that will be capable of competing in Europe within a five year period." "I'm 52 this year and have to look at any opportunities that come along. That is not to say I have been using Palace as a vehicle in the last year." "My mind was definitely made up when my mother's side of the family, who are all Irish, told me to declare for Mick's team." "I’m definitely 100 per cent Irish now. I got on really well with Robbie Keane, Ian Harte and Gary Kelly - they are all top men over there and it was a very good craic." "Billy Gilbert hit a kamikaze back pass which Justin Fashinu pounced on like a black Frank Bruno." "I'm not going to make it a target, but it's something to aim for." "I've only taken one penalty before - for Crystal Palace. It was 2-2 in the 90th minute. I hit the post and we went down that year." "To be honest I thought in extra time both teams had settled for a replay. I was panicking then, because I hadn't re-booked our hotel for midweek." Steve Coppell talking to his team in the dressing room, which included Stan Collymore. Coppell: We have to treat this like a cup match, it's very important. Collymore: Sorry boss I can't! Collymore: Boss, I have already played in the cup this year and I'm cup tied! "I was watching the Blackburn game on TV on Sunday, when it flashed on the screen that George (Ndah) had scored in the first minute at Birmingham. My first reaction was to ring him up. Then I remembered he was out there playing." "Andy Gray picked up the ball to start the Palace attack... and the Scottish veteran finished the move himself." So - blond-haired Scot in his thirties: young black English midfielder in his early twenties. Remind me again; which Andy Gray *was* it who used to play for Palace...? Tomas Brolin said in the Sun not long after retiring: "From a young age I felt like my mission in life was to make shoes." As you may know he now owns a Swedish shoe company. Why the hell did he come to Palace? He was later quoted to say that he liked the amount of shoe shops in London. I remember Ray Lewington referring to Bruce Dyer by saying: "He's got a heart like a dustbin." Carlo Nash stating the obvious after our 6-1 away win at Reading in 1996: "When I conceded the penalty, the ref could have sent me off, but he didn't and I'm really quite happy about that." Fatboy Slim said in 2003: "It shames me to say that because I grew up in Reigate, for the early years of my life, I supported our arch rivals Crystal Palace." 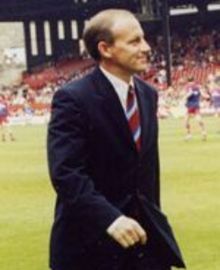 Simon Jordan: "I'm not going to drag it out or make a point, because points are pointless"
Steve Coppell: "He's carrying his left leg, which, to be honest, is his only leg."